Terazije is the central square and an urban neighborhood of Belgrade. 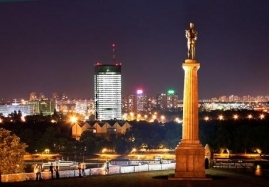 Terazije itself is also a short street, despite the fact that many Belgraders consider the Republic Square or Kalemegdan to be the city's centerpiece areas, Terazije is Belgrade's designated center. Terazije started to take shape as an urban feature in the first half of the 19th century. As the central and one of the most famous squares in Belgrade, it is the location of many famous Belgrade buildings: The most important hotels, restaurants and shops are and were located here. On one side, the square extends to the Knez Mihailova street, the pedestrian zone and one of the main commercial sections of Belgrade. On the opposite side, the square is occupied by the Staklenac (Serbian for glassy), the Belgrade's first modern glass and steel constructed shopping mall. All our apartments are on the short walk distance from Knez Mihailova street.